Waking or the Dreaming state, not the Deep Sleep state. Yoga Nidra relates to conscious Deep Sleep. Dreaming and Not-Dreaming are NOT the same thing. This article is available in printed and bound form. classes, seminars, or workshops on Yoga Nidra. Advanced Yoga Nidra: The form of Yoga Nidra being described in this article can be called Advanced Yoga Nidra. In recent years Yoga Nidra has been distorted in ways similar to Yoga itself. Unfortunately, almost any guided practice that brings a modicum of relaxation is now called Yoga Nidra. Therefore, it is now virtually essential that we use another term, such as Authentic Yoga Nidra, Traditional Yoga Nidra, or Advanced Yoga Nidra. I've opted for the term Advanced Yoga Nidra in this article. Yoga Nidra means Yogic Sleep. It is a state of conscious Deep Sleep. In Meditation, you remain in the Waking state of consciousness, and gently focus the mind, while allowing thought patterns, emotions, sensations, and images to arise and go on. However, in Yoga Nidra, you leave the Waking state, go past the Dreaming state, and go to Deep Sleep, yet remain awake. While Yoga Nidra is a state that is very relaxing, it is also used by Yogis to purify the Samskaras, the deep impressions that are the driving force behind Karma (See Karma article). Yoga Nidra has been known for thousands of years by the sages and yogis. Of the three states of consciousness of Waking, Dreaming and Deep Sleep, as expounded in the Upanishads, particularly the Mandukya Upanishad, Yoga Nidra refers to the conscious awareness of the Deep Sleep state, referred to as prajna in Mandukya Upanishad. This is the third of the four levels of consciousness of AUM mantra, relating to the state represented by the M of AUM. The four states are Waking, Dreaming, sleep, and turiya, the fourth state. The state of Yoga Nidra, conscious Deep Sleep, is beyond or subtler than the imagery and mental process of the Waking and Dreaming states. As a state of conscious Deep Sleep, Yoga Nidra is a universal principle, and is not the exclusive domain of any more recent teachers or traditions. Meditation: Imagine that you are in the WAKING state, with all of its distractions of mind. You systematically do this and that with directing your attention. You are practicing concentration and letting go, leading you towards meditation. The thoughts and pictures of the DREAMING state start to come to the surface, even though you are still in the WAKING state. Gradually, the distractions fade away, your mind becomes focused, and you are having a nice meditation. You are deeply relaxed. You are still in the WAKING state of consciousness, which is the nature of meditation. Yoga Nidra: Now, imagine that at some point you DROP or FALL or EMPTY (or other such words) into the STATE of DEEP SLEEP, much like you would normally do at bedtime (when not Dreaming). However, this time, you fell all the way THROUGH the Dreaming state, and came to rest in the DEEP SLEEP state, though, paradoxically, you remained aware and alert. This is the level UNDERNEATH both the WAKING and DREAMING states, and all of the thoughts and impressions that go along with those two states. Now you are in the STATE of CONSCIOUS DEEP SLEEP. This state is the state of YOGA NIDRA (Yoga Nidra refers to a state of consciousness, not just the methods that lead you there). Nidra means sleep (not Dreaming), and Yoga means union, where all of those other thoughts and impressions have receded back into the unified field from which they arose. Swami Rama describes "sleepless sleep"
in this 1973 cover story. "One of the popular terms arising from exploration into the mind is alpha wave. Again, the Swami points out a common misconception and says emphatically, 'Alpha and meditation are not the same. Alpha is created by relaxation. It is not a high state. Once, when I hooked my German Shepard dog to the biofeedback machine, he created 75 percent alpha.'" Companions to the higher goal: This is not yet the higher goal of sadhana (spiritual practices), which is to experience consciousness itself, independent of any grosser false identification, etc. (one might call this purusha, atman, or the experience of the state of turiya, the fourth, but that's a different thing, which is just beyond the level of conscious Deep Sleep, the goal of Yoga Nidra). However, Meditation and Yoga Nidra work together, as companion practices, in preparing one for such higher experience. In Meditation, you remain in the Waking state of consciousness, and gradually allow the layers of the unconscious and subconscious to come forward, expanding the Waking state with one-pointed concentration and non-attachment to the streams of impressions flowing in the field of mind. In Yoga Nidra, you leave the Waking state of consciousness, and go to the Deep Sleep state of consciousness, yet, paradoxically, remain fully awake. It is an extremely relaxing state in which samskaras of attachment and aversion, the driving force behind karma, are attenuated in strength. Reverie that is experienced between the Waking and Dreaming states, such as when you sometimes wake up in the morning with a pleasant half-here and half-there feeling, is not Yoga Nidra. This reverie is often the goal of relaxation and visualization exercises, but Yoga Nidra is far deeper. Yoga Nidra brings access to the to latent, or subconscious level of mind, that is underneath even the processing, fantasizing, imaging level of mind. It is the doorway to the causal level of reality, out of which springs the subtle, psychic, astral plane of reality, which in turn brings forth the gross level. Meditation and Yoga Nidra work together, as companion practices, through which you purify the deepest levels of the mind, and expand the conscious state to include what was previously unconscious. Finally, the expansion includes the realization of the pure consciousness that permeates all of the levels. not the methods that lead you to that state. Dreaming State: In the Dreaming state of consciousness, the level we call Conscious functioning has receded back into the field of mind from which it arose. Only the Unconscious processing is still there, along with the storage source of the Subconscious. The impressions from the Subconscious stir and become part of the dream process that is going on in the Unconscious level of mind. Deep Sleep: In the Deep Sleep state of consciousness, both the Conscious and Unconscious levels have receded back into the field of mind from which they arose, where memories are stored. Only the Subconscious level is still active. At this Subconscious level the memories are in a formless form, and there are therefore no pictures or images as in the dream state. Rather, this is the level that gives birth to those images. At this level there is also no playing out of thoughts and actions in the Conscious state either. This deep stillness is the domain of Yoga Nidra, when experienced consciously rather than inertly, as in typical sleep. Conscious Deep Sleep: To repeat, Yoga Nidra is the state of conscious Deep Sleep. It is beyond, or deeper than these other practices, however useful they may be. Compatible, not contradictory: It is easy to fall into the trap of thinking that because the state of consciousness of Yoga Nidra is beyond or deeper (see above) than that of some other practices, this also necessarily means better. One might then seek and do what is perceived to be the better practice, avoiding what is perceived to be the lesser practice. Regardless of what names or terms one uses, such as Yoga Nidra, Dhyana (meditation), or Smriti (mindfulness), the practices with the three levels of Waking, Dreaming, and Deep Sleep states of consciousness are compatible, not contradictory. For the Yogi, practices are done with all three levels, regardless of what he or she might call those levels and the methods of practice. This would still be true if the name Yoga Nidra had never been used by anybody for any practice or state of consciousness. The Yogi consciously explores the Waking state. The Yogi consciously explores the Dreaming state. The Yogi consciously explores the Sleeping state. The Yogi seeks to experience all three collectively. The Yogi seeks to experience the Absolute beyond all three. Formless thoughts: To understand Yoga Nidra, it is imperative to understand that thoughts are in a formless form. There are literally no pictures and no words (as there are in the Waking and Dreaming states). There is no visual awareness of any form whatsoever, including the physical aspects of your own body, or of any dream sequence. Yet, there is a truer, deeper knowledge than any of the knowledge that is of pictures and words. This level has been called the infinite storehouse or knowledge, or the infinite library (Deep Sleep, Prajna). Birth of dreams: While there are no pictures at this level, attention may drift slightly outward (thus, starting to leave Yoga Nidra), through the transition stage between the Deep Sleep state and the Dreaming state. Here, the birth of images leading to dream sequences and mental processing is experienced. In Yoga Meditation science, this transition stage is called Aladani, somewhat like the story of Aladin's lamp, where the genie who was in latent form (like in Deep Sleep) goes through a transition stage of being like a wispy cloud before taking the human like form (first in the Dreaming or subtle level, and then in the Waking or gross level). Beyond archetypes: Some schools of psychology refer to deep impressions of archetypes. However, these archetypes are referred to as having form. In the context of these archetypes, Yoga Nidra is touching the causal level that is prior to, or underneath the archetypes. It is the seed or bija level out of which the archetypes and subsequent dramas arise. Attenuating Karma: It is because of the access to the seed or bija level that one is able to directly attenuate the samskaras, or deep impressions that drive karma, or actions. Consciousness is there 24-hours: Another way to view this process is that the consciousness at the subtler level is existent 24-hours per day. Sometimes that consciousness comes outward, expressing into the subtle, psychic, or astral level, which we commonly know as Dreaming state. At other times consciousness comes even further outward, expressing into the gross, external world through the physical body. Viewed this way, it is also easier to see how it is that the sages have said that death, Deep Sleep, and samadhi are very similar, or related like siblings. The depth of Yoga Nidra has become almost lost in recent years, as has happened with Yoga in general. Here are a few points that should help to clarify the nature of Yoga Nidra. Not merely relaxation: It has become popular to use the term Yoga Nidra for any method that might help induce relaxation. Yoga Nidra is not mere relaxation, as very useful as relaxation exercises might be. Yoga Nidra is a specific state of consciousness, which has to do with the conscious experience of dreamless, Deep Sleep. This may seem unimportant, but if one does not discern the difference between relaxation and Yoga Nidra, the greater depth of Yoga Nidra might be completely missed. Better that one see the difference, enjoy relaxation for its own value, and then pursue the depths of Yoga Nidra when he or she is ready for this deeper practice. Not guided imagery: If one is in the process of guided imagery, that is not Yoga Nidra. Guided imagery may be a very useful practice, and may be used as preparation leading up to Yoga Nidra, but it is not, itself, Yoga Nidra. In the depth of Yoga Nidra, the aspects of mind used for visualizing have receded, as described in the last section. Guided imagery is not, itself, Yoga Nidra. Affirmations are not Yoga Nidra. Music is not Yoga Nidra. Yoga Nidra is not new. Not affirmations or autosuggestion: Yoga Nidra is also not a practice of autosuggestion or verbal affirmations, whether affirming desired personal qualities or worldly objects that are desired. It is also not a process of verbally affirming that you are in Yoga Nidra. If you are still in such a conscious level that you are still making oral affirmations of any kind, then you are definitely not in the subtle state of Yoga Nidra. In such a case, the conscious, Waking state mind has not yet receded into the cause from which it arose. Not the law of attraction: There is a popular movement sometimes referred to as "the law of attraction" whereby various visualizations or intents are programmed into the mind so as to manifest worldly gains such as money, new cars, or relationships. This kind of "sankalpa" or "intention" is now being used in alignment with Yoga Nidra. Some of the so-called teachers of these new "Yoga Nidra" techniques are charging large amounts of money to help people learn, in turn, to manifest the same. The sages have used this deep state of consciousness as a means of burning up desires so that they are transcended, not of affirming them so they are brought into being. The process has been effectively reversed virtually 180 degrees. Not music: Yoga Nidra is also not music, as relaxing as music might be to the conscious mind. It is not that music is a bad thing to experience. It might be very pleasant, but it is simply not Yoga Nidra. No amount of pretending that it is will make it so. Yoga Nidra is the experience of conscious Deep Sleep (Prajna), and that does not occur while you are listening to music. Not "alpha" or reverie: Between the Waking and Dreaming states there is a transition stage that is often called "reverie." We have virtually all experienced this relaxing, intriguing, insightful and useful state from time to time in the early morning transition as we awaken from sleep. This stage of awareness is often cultivated in relaxation training, and correlates with alpha brain waves. However useful and pleasant this may be, it is, however, NOT the stage of Deep Sleep, which is characteristic of true Yoga Nidra. Unfortunately, it has become common to use the term "Yoga Nidra" for any type of relaxation. Not visualizing or Dreaming: The state of conscious Deep Sleep is a formless state where there are no pictures or words. Exploring the images and pictures of the mind field is a very useful, if not essential part of meditation. However, one of the unique features of Yoga Nidra is that it is experienced beyond these gross and subtle levels of mental process. It is a sometimes exasperating thing to have to keep explaining, but it is a universally known feature of Deep Sleep that there are no images. If there are images, that is Dreaming state, NOT Deep Sleep state. Yoga Nidra relates to conscious Deep Sleep. To understand this is very difficult for modern students because of the increasing number of articles, books, seminars and lectures that incorrectly claim that Yoga Nidra is about exploring these images. Again, those are useful processes, but by failing to understand the depth of Yoga Nidra, that depth will never be experienced. It is imperative to understand that Dreaming and Not-Dreaming (Deep Sleep) are two different processes or levels of consciousness. Some phases of meditation deal with those Dreaming level images, but Yoga Nidra relates to conscious Deep Sleep. Not new: Yoga Nidra is an ancient most, universal process that has neither been invented nor rediscovered in recent years, as is claimed by some. This practice has been known to the sages of the Himalayas for a very long time. With some reflection on the nature of Yoga Nidra as conscious Deep Sleep (Prajna), it is self evident that this is a universal process. These levels of consciousness are addressed throughout the Upanishads, and particularly the Mandukya Upanishad. Not a "brand name" practice: Many of the modern so-called "styles" of Yoga have a man's name in front of it, as if that man had invented Yoga. Sadly, the same thing is now happening with Yoga Nidra as well, with a person's name being put in front of the words "Yoga Nidra." The egotism and arrogance of modern so-called teachers knows no limits. Not trademarked: When you come to see that Yoga Nidra refers to conscious deep sleep, the notion of trade marking Yoga Nidra is seen as absurd. How does a yogi sleep? Consciously. That is Yoga Nidra. How can anybody be so confused as to think you can trademark "sleep?" It seems so very unlikely, yet this is what is happening in our modern world. Only the most dedicated of practitioners will see past this play of egos so as to see and experience the universal experience of conscious deep sleep, or Yoga Nidra. Yoga Nidra means Yogic Sleep. It is a state of conscious Deep Sleep. In Meditation, you remain in the Waking state of consciousness, and gently focus the mind, while allowing thought patterns, emotions, sensations, and images to arise and go on. However, in Yoga Nidra, you leave the Waking state, go past the Dreaming state, and go to Deep Sleep, yet remain awake. Depth comes in time: What if you are practicing Yoga Nidra, but not yet attaining the state of Yoga Nidra? The practices leading up to Yoga Nidra are very useful. It is good to enjoy that relaxation and training of the mind. At some point, the practice deepens, maybe just for a moment, like a flash, when one experiences the depth of Yoga Nidra. It may come soon, or it may come later, but it will definitely come with patience and practice. Beta 14-30 Typical level of daily mental activity, alert, active. It is also the level of activity associated with tension or stress. Alpha 8-13 Relaxed, passive attention, reverie, often considered the goal of relaxation exercises. While this is a very relaxing state, and useful to be practiced, it is sometimes incorrectly thought to be the goal of Yoga Nidra. Theta 4-7 Normally considered to be unconscious, possibly drowsy, or half-asleep. This level is also sometimes incorrectly considered to be the level of Yoga Nidra, where there is still the experience of images and streams of thoughts. Delta .5-3.5 Considered to be unconscious, dreamless, Deep Sleep (Prajna). In Yoga Nidra, the brain waves are at this level, as the practitioner is in conscious Deep Sleep, beyond the activity experienced at the other levels. Relaxation may come first: When first practicing Yoga Nidra, there is a good chance that one might not experience Yoga Nidra itself. The practices might be very relaxing, with brain waves slowing from Beta to Alpha or Theta, but not slowing to the Delta level. Or, the other possibility that often happens initially, is that one falls asleep into the Delta level, losing conscious awareness, and thus not experiencing true Yoga Nidra. Be patient: It is important to be very patient over time in practicing Yoga Nidra. The relaxation that comes with the Alpha and Theta levels can be extremely useful for mental, emotional, and physical health. It is not bad that one does not initially experience the depth of Yoga Nidra by consciously entering Deep Sleep and Delta. These relaxing experiences are a very nice part of life, and also prepare one for the later experience of the depth of Yoga Nidra. Delta brainwaves, not Alpha: There has been some degree of confusion circulating about Yoga Nidra and brain waves. Possibly due to the fact that many experience only the Alpha level of brain waves initially, many teach that Alpha is the goal of Yoga Nidra. While the Alpha or Theta levels can be very useful steps along the way, the ultimate goal of Yoga Nidra is the experience of conscious Deep Sleep (Prajna), which correlates with Delta brain waves (True Yoga Nidra practice ultimately leads to awareness beyond any level of physical brain functioning). Yogic Sleep, not Yogic Dreaming: Remember, the aspirant wants to reach Yoga Nidra, conscious Deep Sleep, so that the samskaras, which are the driving force behind karma, can be purified in their latent, formless form. And this process happens beyond, or underneath all of the activity in the Waking and Dreaming states of mind. Yoga Nidra means Yogic Sleep, not Yogic Dreaming. Methods are preparation: Think of parachuting. You get into an airplane. The airplane takes off. It climbs up to its altitude. The pilot positions the airplane in just the right place, and then slows down. Then, finally, you jump out of the airplane and start to parachute. None of the steps leading up to that were themselves parachuting, nor is the airplane itself really related to parachuting directly. The airplane and the actions of taking off, climbing, and moving here and there were only preparation for the moment where one can do the part called parachuting. Variety of methods: In addition, there are different types and sizes of airplanes from which one could parachute. One could also parachute off of a cliff, a tall building, or a high bridge. Each of these are methods of bringing you to the point of parachuting. The same is true of the various methods of bringing you to the point of jumping off into the state of Yoga Nidra. Jumping off: Entering Yoga Nidra is like jumping out of the airplane. There are many methods one can do to train the mind, to move the attention here and there, so that you can then jump out of the Waking and Dreaming states of consciousness into the fully conscious experience of Deep Sleep (Prajna). That is the experience of Yoga Nidra. that might lead you towards Yoga Nidra. Seek the depth beyond imagery: There is a reason that it is so important to know that Yoga Nidra is a state rather than the methods. It is very easy to practice the techniques, but to incorrectly think that the goal is merely to relax through creative visualization. Creative visualization alone might be a useful practice, but by staying in those shallow waters, the deeper value of Yoga Nidra will be missed. One can practice visualization exercises for many years, and not be aware of the depth of Yoga Nidra. Remember the parachute metaphor, and that while creative visualizations might be useful in the practice leading up to Yoga Nidra, the Yoga Nidra itself comes by going beyond all of the imagery. Emptying: By being aware of the differences in the levels of practice, one can consciously work on reaching the end of the practice, the point where it is time to jump out of the plane, into the emptying practice that is Yoga Nidra. This emptying process is further described in a later section of this article. Examining: While Yoga Nidra is very relaxing, it is also an extremely useful state for spiritual practices. The yogis use Yoga Nidra to examine thought patterns in their latent, non-active form. the driving force behind karma. Samskaras: This level of consciousness is the place where thoughts, emotions, images, and sensations go when they recede from their actions in the Waking and Dreaming states. These formless forms, or deep habit patterns are called samskaras, which are the driving force of actions, or karma. Reducing deep habits: Thus, Yoga Nidra is a tool for examining, attenuating, and eliminating habit patterns or samskaras, which are not useful. Habitual negative actions, normally arising from these deep impressions can thus be reduced and eliminated through the practice of Yoga Nidra. Undistracted by the formless: In the Waking state, thought patterns can be troubling. In the Dreaming state, they can form trains of thoughts that seem to drag you around. However, imagine that you could observe your thought patterns when they were not active, when they were in a latent, sleeping form, while you were awake. Then they would not disturb or distract you. This is what happens in Yoga Nidra. The paradox is that while they are not in active form, they are still there. This can be frustrating to try to conceptualize, but this is as close as we can get, to just say they are in a formless form. Subtle thoughts with little charge: Imagine a photo on the screen of your computer. It might be a picture you find pleasing or offensive. However, imagine that you saw a print of the binary numbers, all of the zeros and ones, that mathematically formed those pictures in the memory of the hard disk. There would be no reaction whatsoever. There would just be a bunch of numbers, without any emotional charge to them. This is what happens when witnessing samskaras (deep impressions that drive karma, or actions) while you are in Yoga Nidra. There may be subtle traces of emotions, but they are very, very subtle, and do not seem to have the charge of active desires, wants, wishes, dislikes, or aversions. Transformation of samskaras: By witnessing the samskaras in the state of Yoga Nidra, a certain transformation happens. They start to lose their coloring of attraction and aversion. They start to weaken, and are less and less able to later control our thoughts and actions. In this way, we use Yoga Nidra to reduce or soften the impact of our samskaras that play out as karma. Who I am: Through Yoga Nidra, there is an ever increasing awareness that, "Who I am is different from my thoughts!" In Yoga Nidra, you experience consciousness underneath, or prior to all of the active mental process, both conscious and that which is normally unconscious. Being awake in this place, underneath or behind the thinking process can seem quite strange, bewildering at first. Gradually, it brings increasing peace of mind and insight about the nature of who we truly are. Doorway beyond: In Yoga Nidra one touches the doorway to the awareness that still operates beyond all of the levels of mind, that leads to realization of the center of consciousness, or Self. It comes in time: Once again, you may or may not reach the state of Yoga Nidra in the beginning. It does not matter. The deeper experience of Yoga Nidra may come soon, or it may come later, but it will definitely come with practice. In any case, you will surely find Yoga Nidra to be a very relaxing part of your life. A halfway step: Gradually the curtain opens, and you see the objects on the set of the play and the actors. This is like viewing the Dreaming state of consciousness, the unconscious mind. This is a stance of Meditation, where you stay in the Waking state, allow the veil to open, and the unconscious comes forward, while staying focused. However, Meditation and Yoga Nidra are two different things. Sometimes, it can seem that Yoga Nidra is that state halfway between the Waking and Dreaming states, but this is not so. This halfway place is only a step along the way. Beyond the dreams: Imagine that the curtain is completely open, but that instead of watching the actors and the stage set, you look beyond, searching for the backdrop behind them. You get up from your seat and walk onto, and through the stage and the actors to the backside of the stage, completely ignoring the set and the actors. You look, but you see nothing there. It is as if the theater has been set up in a desert on a moonless night. There as an ocean of emptiness behind the actors that feels strangely not empty. It is as if it is completely full of potential or being-ness, but yet has no specific form. This is the nature of Yoga Nidra. It is like being in the Deep Sleep (Prajna) state, yet fully conscious. There are no dreams playing out, no fantasies, no subtle realm! Deep, formless sleep: Yoga Nidra is not between Waking and Dreaming. Rather, it is beyond both of them. It is equivalent to the Deep Sleep state, where there are no images, no dramas being played out. There is only a deep abiding stillness that is rich with awareness. It is like the awareness of the endless backdrop of stillness behind the actors in the desert play. It is a state where one comes to see the pure potential of existence without form. It is not yet samadhi or turiya, that state beyond all of the other states, but it's pretty close. Leap into stillness and silence: In Yoga Nidra itself, the mind is not being directed here and there. There is no guided imagery, no exploration, and no effort whatsoever to be aware of any object or part of your body or being. Rather, you go into a deep state of emptying. All of these other processes and practices are used to gently guide your attention inward, further and further, until your attention finally leaps into the deep stillness and silence of conscious Deep Sleep (Prajna), Yoga Nidra. In Yoga Nidra practice, you invite your attention to go deep into the stillness and silence, in the space between the breasts. As you move into the state of Yoga Nidra itself, you want to “empty, empty, empty” the field of mind. There may be thoughts in the Dreaming mind, but you have gone past that in Yoga Nidra. Just like your attention has left the activities of the external world, your attention has also left the Dreaming state of mind, and gone further inward. From this vantage point, all of that mental activity is now external, and is not even noticed. Here, you completely let go of any words, thoughts, images, impressions, or pictures in the mind--completely empty. It is this emptying which takes you to Yoga Nidra, to conscious Deep Sleep. You focus your attention in the space between the breasts, and go deep, deep into Yoga Nidra. Explore what is, not just fantasy: Recall again, that you use various methods to move towards the state of Yoga Nidra. While these might involve visualizations to relax the body and focus the mind, what is recommended is the exploration of the aspects of yourself that are already there, rather than creating some new fantasy. For example, if you visualize a beach or a forest, or imagine sounds of animals or nature, this is creating a hallucination in the mind. If you systematically explore points within, or the flow of energy of breath, you are examining aspects of what is actually there, so you can then go beyond. Relaxation versus Deep Sleep: Said differently, you could say that there are two common usages of the name Yoga Nidra. First, is Yoga Nidra as a relaxation exercise, in which there is guided imagery. Second, Yoga Nidra is the conscious Deep Sleep (Prajna) state, without such imagery. The latter is the true intent of Yoga Nidra. Empty into the space rather than the chakra: The descriptions above suggest that you empty into the space between the breasts. While we might describe this as emptying into the chakra that is there, that might suggest some form of visualizing, as if we are trying to see or experience an object or thing that is called chakra. The use of the word space suggests that we are not seeking any such object. In other practices, you surely might do that, but here, in Yoga Nidra, we are wanting to empty into that space. It is a matter of convenience and clarity that we are describing the starting point of that final inner emptying by saying we are emptying into the space between the breasts. Body and breath are left behind: It is also important to note that at this stage of entering Yoga Nidra itself, the state of conscious Deep Sleep, awareness of body and breath have been left behind. Attention has moved much further inward from awareness of any aspect of the physical body, any awareness of breath, and any imagery of mind. This is a sequential process of moving inward: first the body, then the breath, then the mind, and then the emptying into Yoga Nidra, conscious Deep Sleep. The Three Cities: Imagine that you are in a country called Alphabetland, and that you left City A in your car, drove through City B, and arrived in City C, your final destination. City A is in the plains; City B is near the mountains; City C is by the ocean. After your trip, you talked to your friends on the telephone and told them all about your journey. Would you tell them that City C had beautiful plains and grasslands, even though those are really qualities of City A? Would you tell your friends that City C had beautiful forests, mountains, and streams, even though those are descriptions of City B? No. When you told them about City C, you would tell them only about the beautiful beaches and ocean, which are a part of the nature of City C. Surely, you would tell them about the other cities along the way, but you would not confuse the destination with the cities and scenery you encountered along the journey. You would not attribute the qualities and experiences of Cities A and B to City C.
Discriminate between journey and destination: Like confusing the cities along the way with the destination, it is very common for people to comment or ask questions about Yoga Nidra, yet actually be talking about experiences of the Waking state or the Dreaming state (Waking is like City A; Dreaming is like City B; Deep Sleep is like City C). While the contents, experiences and activities of the Waking state of reality and the Dreaming (or subtle) state are explored through Meditation, the exploration of these two states or levels is not the subject of conscious Deep Sleep (Prajna), or Yoga Nidra. It is very useful for the practitioner of Meditation and Yoga Nidra to be aware of these differences. As noted near the beginning of this article, Meditation and Yoga Nidra are companion practices. Yogic practices with Waking, Dreaming, and Deep Sleep are surely complementary, but they are different from one another. Practices with active and latent impressions: To know that there are multiple levels or layers will help a great deal with Yogic practices. One of the main reasons this is important, is that it leaves us two general ways to work with practices. One way is to work with the processing, active images and impressions (again, whether in Waking or Dreaming). The other way is to work with the impressions in their latent, formless form, and this, like it or not, is another level of reality, which is underneath both the Waking and Dreaming states. It is the level at which the samskaras, the driving force behind karma, are stored. Meditation in action (or mindfulness, if you prefer) and seated Meditation that explores Waking and Dreaming (subtle) both deal with the levels of active images and impressions (until it expands into deep Meditation or samadhi). Yoga Nidra works directly with the latent level of consciousness that is related with the Deep Sleep level. Once again, names of these levels and practices do not matter nearly as much as understanding that the active and latent aspects are there--working with them both, in their own ways, is extremely useful to the path of Self-realization. Do names really matter? : In some sense, none of these names really matter. Does it matter whether we call it Meditation or Yoga Nidra? Does it matter whether we say the Dreams and the subtle realm are in Taijasa, or that Deep Sleep has to do with the Prajna level? What does matter very much, is that we remember that we are not just talking about two levels of consciousness (seen and unseen, worldly and spiritual, here and there, etc.). We are not just talking about one, single level of consciousness that is beyond our typical, Waking, day-to-day awareness. Rathere, there are two major levels of consciousness (or reality, or whatever we want to call it) beyond our typical, daily awareness. Chakras: The three states of consciousness are Waking, Dreaming, and Deep Sleep (Prajna), and these predominantly operate from three separate chakras. 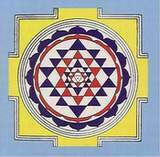 It is relatively easy to note that our Waking state operates from the area of the Ajna chakra. Simply notice that it is this area of the face from which we think, see, hear, and smell, etc., when we are in the Waking state. At other times, in our language, we refer to falling asleep into those lower chakras, as we enter Dreaming and Deep Sleep. Heart chakra and emptying: Yoga Nidra is practiced by emptying into the space between the breasts, the heart chakra. In the Waking state, consciousness operates from the eyebrow center, as the command center for mental and sensory process. In the Dreaming state, the throat center is the place from which consciousness operates (note that the throat chakra is often described as a creative center, and that creativity is manifested, in part, as dream sequences). In the Deep Sleep state, awareness automatically operates from the space between the breasts, the heart center. Empty into the heart center: It is important to note that the question of chakra for Yoga Nidra is an entirely different question of which center on which one focuses for Meditation. One's predisposition at a personality level may be, for example, on feelings in the heart or thoughts in the eyebrow center. For Meditation, one may follow that predisposition as the space for focus. However, at the depth of the three levels of consciousness themselves, all people are constructed the same way, and thus the space between the breasts is the space for emptying into Yoga Nidra. It is the natural place where consciousness rests during Deep Sleep. It is also worthy of note that, from whatever chakra one might be practicing Meditation, there may come a moment, in a flash, that attention enters the subtle channel called brahma nadi, which goes between the eyebrow center inward and upward towards the crown chakra. This is sometimes mentioned in relation to a person seeing light at the end of a tunnel. This process need not be confused with questions of ones predispositions for Meditation, nor for emptying into the heart for Yoga Nidra. From gross to subtle: There are many methods leading up to the point where you can jump off into the state of Yoga Nidra. The idea of working with those preparatory methods is that you start with your attention on the gross aspects of you being, such as the physical body, then systematically move awareness inward to the subtler levels. Progressive inner attention: For example, moving breath awareness up and down the stream of light in the spine is subtler, deeper, more interior than moving inner awareness through the physical parts of the body. Progressively, attention goes inward to that final, inner place of jumping off into the stillness and silence of Yoga Nidra. Many ways: So, for example, how many ways can you move awareness through the physical body? Many! How many ways can you work with breath awareness? Many! How many ways can you explore the subtler energy flows? Many! used to attain that state. State versus methods: The point, once again, is that while the various methods are extremely useful in leading awareness subtler and subtler, Yoga Nidra itself is a state of consciousness, not the methods that lead you to that state. Yoga Nidra is a state of conscious Deep Sleep (Prajna). Simple methods lead to emptying: Each of the various methods are also pretty simple, in that they all involve the straightforward shifting of attention here and there, in ever subtler ways. The difficulty, if it can be called a difficulty, is in the act of letting go itself, of the determined, willful emptying that leads to Yoga Nidra. But that too comes with practice. Universal: It is important to once again note that the state of Yoga Nidra is universal, regardless of whether or not one has ever heard of it as the name Yoga Nidra. Yoga Nidra, as such, has been known to the yogis for thousands of years, while some reports incorrectly claim that Yoga Nidra was invented in the past few decades by a single modern teacher. Methods: Following are outlines and links to several methods of entering Yoga Nidra. The details of the practices are on individual web pages so that these can be printed out for easier review and practice. The lengths of the practices might vary from as little as 10-20 minutes, or as much as 50-60 minutes or more. The state comes after the methods: As you review these methods and practice them, remember that Yoga Nidra is the state of conscious Deep Sleep (Prajna) that comes after, or as a result of the methods, by emptying the content of images and impressions. Also, there is a guided Yoga Nidra CD available that is similar to Method #2. Or, you might wish to use your own recorder to make a guided practice in your own voice. It starts to come naturally: When one’s whole life becomes one of Meditation, Yoga Nidra begins to come naturally. The nature of daily sleep begins to change. It becomes more conscious when one wants it to be so. Dreams are seen more vividly, and there is often a natural sense of lying in bed sleeping, while still being awake. Awareness more easily goes to the stillness and silence beyond those dreams, into conscious Deep Sleep. Witnessing and determination: How does this happen, that Yoga Nidra comes naturally? As you gradually gain more and more of a witnessing stance about everything external and internal, it becomes easier to set aside mental content with a simple act of determination, sankalpa shakti. In a sense, you simply go there, emptying and entering Yoga Nidra. The pinnacle of the wisdom of the ancient sages is contained in the terse twelve verses of the Mandukya Upanishad, which outlines the philosophy and practices of the OM mantra. It has been said that the juice of the Vedas is in the Upanishads, and the juice of the Upanishads is in the Mandukya Upanishad. Third level relates to Yoga Nidra: The third of the four levels of consciousness mapped out in the Mandukya Upanishad is called Prajna, which is the level of Deep Sleep. This is the domain of Yoga Nidra, which is conscious Deep Sleep. 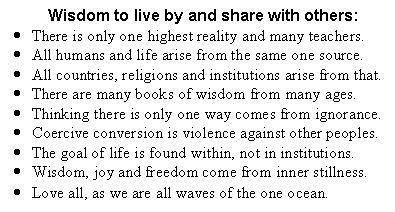 1) All is OM: Hari Om. The whole universe is the syllable Om. Following is the exposition of Om. Everything that was, is, or will be is, in truth Om. All else which transcends time, space, and causation is also Om. 2) Atman has Four Aspects: All of this, everywhere, is in truth Brahman, the Absolute Reality. This very Self itself, Atman, is also Brahman, the Absolute Reality. This Atman or Self has four aspects through which it operates. 3) First is Waking / Gross: The first aspect of Atman is the Self in the Waking state, Vaishvanara. In this first state, consciousness is turned outward to the external world. Through its seven instruments and nineteen channels, it experiences the gross objects of the phenomenal world. 4) Second is Dreaming / Subtle: The second aspect of Atman is the Self in the Dreaming state, Taijasa. In this second state, consciousness is turned towards the inner world. It also operates through seven instruments and nineteen channels, which engage the subtle objects of the mental realm. 5) Third is Deep Sleep / Causal: The third aspect of Atman is the Self operating in the Deep Sleep state, Prajna. In this third state, there is neither the desire for any gross or subtle object, nor any dream sequences. In Deep Sleep, all such experiences have receded or merged into the ground of undifferentiated consciousness. Here, one is filled with the experience of bliss, and can also find the way to clearer knowledge of the two preceding states. 6) Find the Experiencer: The one who experiences all of these states of consciousness is the omniscient, indwelling source and director of all. This one is the womb out of which all of the other emerge. All things originate from and dissolve back into this source. 7) The Fourth Aspect is Turiya: The fourth aspect of Atman or Self is Turiya, literally the fourth. In this fourth state, consciousness is neither turned outward nor inward. Nor is it both outward and inward; it is beyond both cognition and the absence of cognition. This fourth state of Turiya cannot be experienced through the senses or known by comparison, deductive reasoning or inference; it is indescribable, incomprehensible, and unthinkable with the mind. This is Pure Consciousness itself. This is the real Self. It is within the cessation of all phenomena. It is serene, tranquil, filled with bliss, and is one without second. This is the real or true Self that is to be realized. 8) Those Four are the Same with "A-U-M" and Silence: That Om, though described as having four states, is indivisible; it is pure Consciousness itself. That Consciousness is Om. The three sounds A-U-M (ah, ou, mm) and the three letters A, U, M are identical with the three states of Waking, Dreaming, and sleeping, and these three states are identical with the three sounds and letters. The fourth state, Turiya is to be realized only in the silence behind or beyond the other three. 9) The Sound "A" is Waking / Gross: Vaishvanara is the consciousness experienced during the Waking state, and is A, the first letter of Om. That simple sound of A is first and permeates all other sounds. One who is aware of this first level of reality has fulfillment of all longings and is successful. 10) The Sound "U" is Dreaming / Subtle: Taijasa is the consciousness experienced during the Dreaming state, and is U, the second letter of Om. This intermediate state operates between the Waking and sleeping states, reflecting some qualities of the other two. One who knows this subtler state is superior to others. For one who knows this, knowers of Brahman, the Absolute Reality, will be born into his family. 11) The Sound "M" is Deep Sleep / Causal: Prajna is the consciousness experienced during the state of dreamless, Deep Sleep, and is M, the third letter of Om. It contains the other two, and is that from which the other two emerge, and into they recede or merge. A knower of this more subtle state can understand all within himself.